OK, I’m not a farmer…though my kin is. Dad tried to introduce me to gardening many years ago. He started: this is a hoe… Finally the light bulb went off and tried growing some vegetables. Every year is a learning experience and you would think the harvest would get progressively better – it doesn’t work that way. Nature throws chinks in the plans. I decided to document on this blog the experiences about growing veggies in the Midwest. Access to gardening resources are abundant. 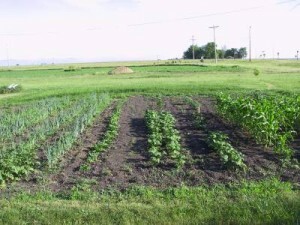 The vegetable garden is located near Peoria, Illinois and has been in use by various people for years (at least 30). Like all gardens, some years have produced abundant veggies and others (like 2005) were terrible (due to a drought). Regardless, everyone looks forward to harvest time. Cletus, myself, and Dona (hence the name DDC) are the keepers of the garden. Every year Cletus preps the garden by plowing it in the Fall then discing and rototilling in the Spring. He always enlarges it because “you need more vegetables”. Much of the soil is amended by compost which we make from leaves, grass clippings, and vegetable scraps. Fortunately, the garden has excellent soil and drainage but every year after plowing we manage to find broken pieces of glass, a few rocks, and other obstructions. This year (2007) I found several hand-made nails. One year I found an 1858 half dollar. Unfortunately it was damaged by a rototiller. I’ve also found a horseshoe. We now have three vegetable gardens. Garden A, shown above in the photo, is about 2500 sq feet. Garden B. Garden C is pretty small. The garden has rows going East-West. A recycled section of the garden, was resurrected and planted with asparagus and strawberries.